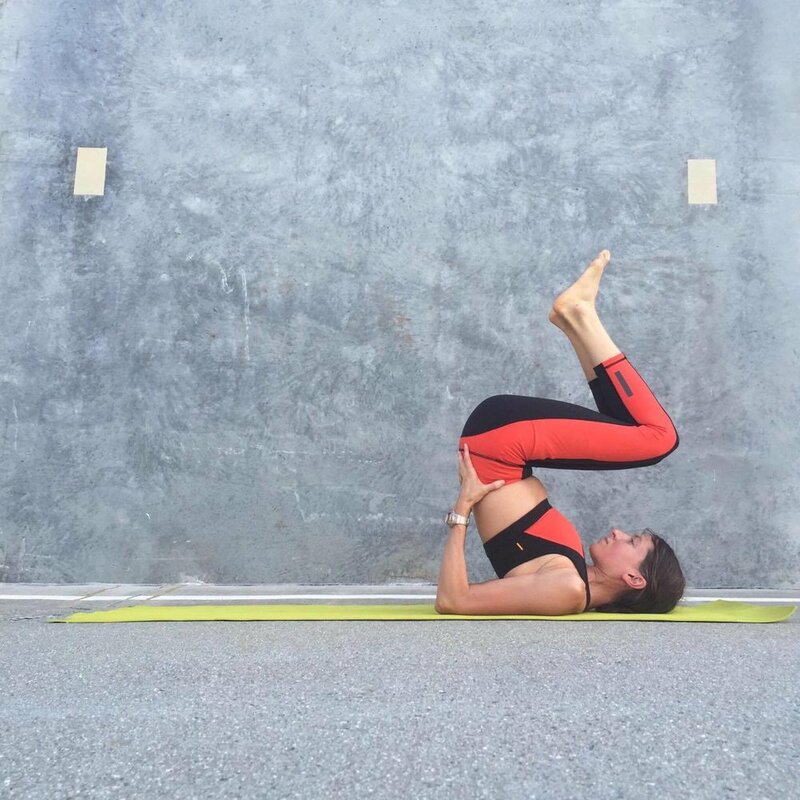 If practiced safely, shoulderstand (salamba sarvangasana) offers a plentitude of benefits—including promoting thyroid function, restoring your legs through the inversion, and stimulating the parasympathetic nervous system to calm you. Traditionally, this pose comes near the end of your yoga practice, but it can also be quite useful as a stand-alone pose for promoting feelings of relaxation anytime. Note that if you have any neck issues, you may want to instead practice “legs-up-the-wall” (viparita karani) instead. Everyone in shoulderstand, no matter what variation, should keep their gaze straight up to the ceiling or on their legs in the air—this protects your neck. You should not look around or turn your head from side to side while in this pose. As with any yoga pose, you should continue to breathe and listen to your body during your practice. Some teachers recommend placing a firm blanket under your shoulders while in this pose. In this variation, your head hangs off the blanket and instead rests on the floor. I actually find that this throws my balance off while entering the pose, and can put additional pressure on my neck rather than relieving it. Please do what works for you—remember that every BODY is different! 1) Setting up the Pose. Begin on your back. Gather knees into your chest with arms along your sides to start. Now, begin to rock back and forth gently. Gather up enough momentum that you can rock your hips up, placing palms on your sacrum (big bones above your hips) as you do so. Here, your thumbs wrap around to the front of your body for additional support. Once you’re here, pause and take a minute to set up your arms—wiggle elbows a little closer together behind you so that they’re not out at your sides. This will give you greater support once you do send your legs to the sky. For now, as you set up your arms, just let knees rest towards (or maybe even lightly on) your forehead. 2) Shoulderstand: Now, extend legs to the sky. Keep gaze up at your toes and DO NOT turn your head. Gently reach through the ball of each foot to keep a little energy going upward. Connect the big toe mound that sticks out of the side of each foot as you reach. Remember to keep your gaze right up at your feet; in other words, your head stays still here and you should NOT turn it from side to side. 3) Exiting the Pose: Traditionally, plow pose or halasana, and then fish pose, or matsyasana are practiced after exiting shoulderstand. You should get comfortable practicing shoulderstand and plow before also adding fish pose. Keep your palms supporting your lower back as you lower legs over your head. a. Plow Pose Modification: If your feet do NOT comfortably hit the ground or remain in the air, keep your palms supporting your back (shown in the first image above). Another modification here is to find a solid chair (something that won’t slip!) and use the seat as a prop for your feet to rest upon. You should test the distance of the chair from your mat by rolling into this version of plow pose first, before your shoulderstand sequence, and then adjust the position of your chair relative to the mat as necessary. Pause and breathe, then keep palms supporting your back as you carefully roll back to a reclining position. b. Plow Pose (second image above): If your feet DO hit the floor, then release palms alongside your body. You may like to try pressing heels away from you (farther from your body, towards the wall now behind you) to get a deeper stretch through the legs. Pause and breathe here. Finally, Moving from Plow to Fish: The exit from full plow pose works very well to set your body up for fish pose. Use your palms as “brakes” controlling the speed of your legs as they float back down from over your head. Move smoothly with control—press into your palms. As your legs float back down, you’ll hit a spot where you feel like you want to arch your back (when legs are about 45 degrees from the floor). When you get there, DO arch your back and PRESS into your elbows and forearms in order to pick up your head, tilting head back into the backbend. Keep pressing into elbows and forearms—no weight whatsoever is on your head here. To come out of fish, press into elbows to again pick up your head and lay it back down. Note that you should probably get comfortable in regular plow pose without any modifications before practicing fish pose. Shoulderstand is a powerful pose that offers many benefits if you practice it safely, continue to breathe, and listen to your body. Once you are comfortable in shoulderstand, try counting your breaths here—add a breath or two each time.